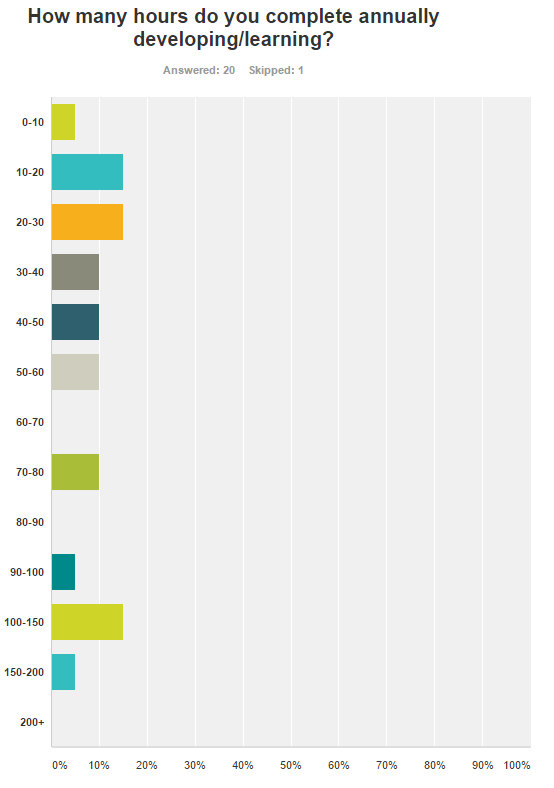 I have analysed the results for the IT Professionals and CPD survey I have been running recently and this blog post is to show them. There were 21 replies to the survey. I would have liked more, however the results illustrate a sample of what IT Professionals are doing for development and CPD. The survey covered 7 questions and out of the 21 replies, some of the questions have 1 reply skipped and some have none. The skips were across different replies so this is not one reply missing questions. In this blog post I will show the initial survey results, then I will go into more analysis, details and thoughts around the responses in further blog posts. Question 1: Do you belong to a Professional Body? With this question I was aiming to see how many replies are influenced by a professional body and their rules on CPD (Continuing Professional Development) and Learning. Out of the 21 replies, all 21 responded to this question. There are lots of professional bodies in the industry today with some being more stronger than others with memberships. I was expecting fewer Yes votes to this question, but was pleasantly surprised to see just under a 3rd being members of a Professional Body. Question 2: Which Professional Body do you belong to? 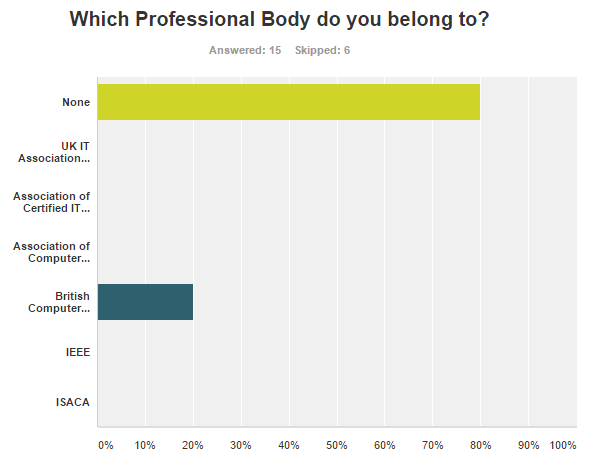 Following on from Question 1 I was then looking to find out what Professional Bodies were represented in the survey. I listed a few Professional Bodies, but also gave the option for other bodies to be entered. 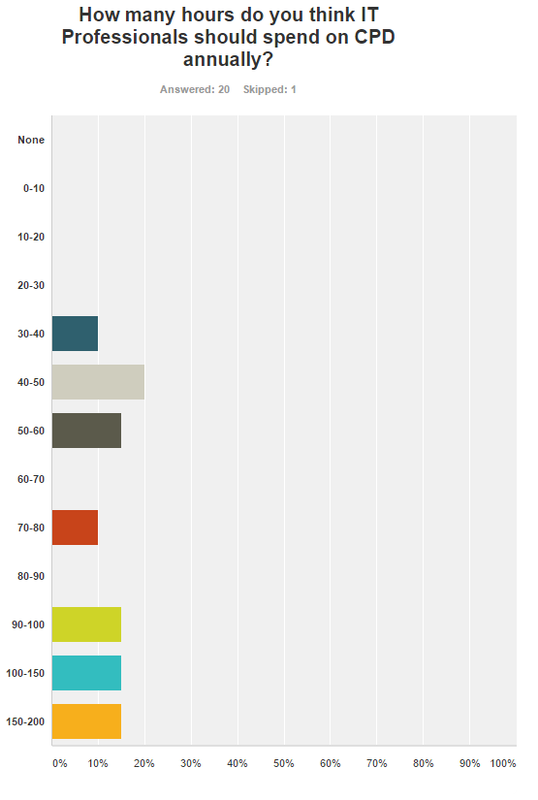 The results below show the surveys listed Professional Bodies – not the manual entered ones. Out of the 21 replies, 15 responded to this question and 6 skipped. 1 Reply had TOGAF as a result as this is more an Architectural Methodology than a Professional Body. Wondered if they meant member of the Open Group instead? 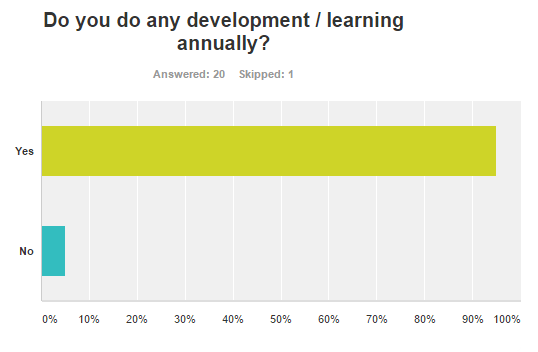 Question 3: Do you do any development / learning annually? In the next Question I wanted to find out how many replies carried out learning and development. Out of the 21 replies, 20 responded to this question and 1 skipped. Not sure why 1 reply skipped this question! Question 4: How many hours do you complete annually developing/learning? Out of the 21 replies, 20 responded to this question and 1 skipped. Based on the last question and going into the results, the reply that said no skipped this question and the reply that skipped the previous question responded to this question. So the replies to this question do align to the previous one. There is quite a spread over the replies illustrating that although most of the respondents carried out annual development and learning there are differences as to how much everyone actually does. 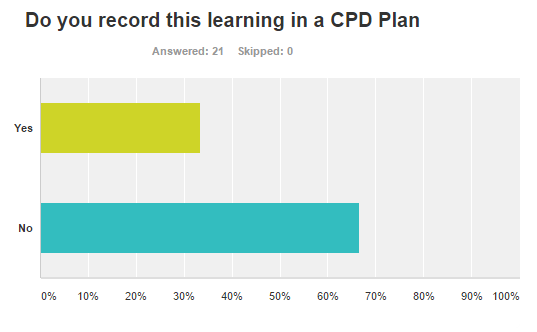 These results are roughly in line with question 1 which is interesting at the initial view to ask the question are these CPD’s influenced by a Professional Body or other things. More analysis of the results is needed here. Question 6: How many hours do you think IT Professionals should spend on CPD annually? I will perform some more analysis between questions 4 and 6 to see if there are any correlations between what respondents do annually and what they think should be done annually. More analysis of the results is needed here. Initially though the graphs show that at least 7 respondents think that they should be doing more than they actually are. Question 7 : Any other comments you would like to add on the subject of Continuing Professional Development (CPD) Hours for IT Professionals? This was an open question to allow the respondents to. Here are couple of the replies. I will analyse these and the other responses further in another blog post. Given the speed of change in IT, I think an average of 2 to 3 hours per week in a mix of verifiable ( e.g. courses (on-line or physical)) and unverifiable- Blogs, papers, news sources, hands on etc. should be a minimum to aim for. This is really important and specially capturing and tracking that give sense of learning. Great work. Can’t wait to hear more about what you think this data means. I noticed a gap between the amount of training IT professionals think they should take and the amount they are actually able to take. I suppose there are many theories about why, but I speculate that it points to a problem with how training is usually structured. I think there is a huge need for microcourses/microlearning — short (5 min -20 min) focused courses delivered via laptop, tablet, or phone. With microlearning, you can context switch easier. You can also fit training into the gaps in your life rather than having to make gaps big enough to fit the training. You can take 20 mins while you are waiting for a meeting to start, or 5 minutes while you wait at the doctor’s office. If training were easier to take and delivered better, we might see an increase in training hours.